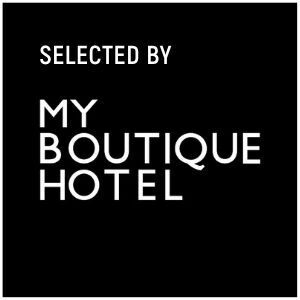 Boutique hotel ZIES is located in one of the most beautiful parts of Utrecht: the Museum Quarter. It is characterized for its medieval houses with beautiful old facades and hidden courtyards and of course the many Museums such as the famous Miffy Museum. 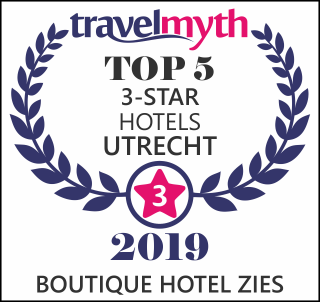 Directly located on the cozy and lively Ledig Erf square with numerous terraces and in the oldest shopping street of Utrecht, Twijnstraat, Boutique Hotel ZIES is the perfect base to explore the city. The DOM Cathedral and the famous canals with their wharf cellars and terraces is at 10 min walking distance. Station Vaartsche Rijn is at 5 minute’s walk and Jaarbeurs at 15 minutes. Also, the Uithof (University and Hospital) , is in 10 minutes reachable by a fast bus. We offer bicycle and scooter rentals to explore the surrounding area. You can ask the hotel staff for more information. We also offer the possibility to park private 100 meters away from the hotel. Reservations are required for this. Cost is 25 euros per day. The hotel does not serve a traditional buffet breakfast because there are many lovely breakfast places in the street. However, we do offer you daily a free of charge breakfast bag with homemade yoghurt with dry fruit jam, fresh orange juice, fruit, and organic banan bread. In case you would like to have a larger breakfast, we can book you a breakfast at restaurant Stael which is 2 minutes walking distance away. Stael is housed in a beautiful historic building which was formerly used as a forge. Here you can enjoy an extensive continental breakfast with coffee / tea of ​​your choice, orange juice, milk or smoothie, croissant, jam, boiled eggs, fruit salad, yogurt, sandwich and scone with clotted cream. Bottle of water in room upon arrival. Kettle with various teas from Newby Tea. Do you wish to stay overnight with your child (0 to 3 years)? We like to place a cot (free of charge) in the room. Because the number of baby cots is not unlimited, we do this based on availability. Let the hotel know in advance and we ensure that everything is arranged for your little one. The entire hotel is smoke free. Our courtyard is available for smokers. Monday till Sunday, check-in possible from 15:00-23:30 PM. Check out is possible until 12:00 PM. After leaving the hotel room you can leave the keys in the mailbox in the corridor of the hotel. The opening hours of our reception are during the week from 15.00-23.30 hrs and on Saturday and Sunday from 11.00-23.30 hrs. Do you use our mini-bar? It will be debited from your credit card. If you wish to arrive earlier than our check-in time, please let us know. We will find a suitable solution for you. If your room is not ready yet, you can of course leave your luggage with us. If you expect to arrive later than the regular check-in time we kindly ask you to contact us prior to your arrival. We are happy to arrange a suitable solution. Do you know that feeling? Do you want to turn around again? at ZIES we are very aware of the fact that sleeping is incredibly important! That is why at boutique hotel ZIES you can stay longer and check out later. The costs for this are €25.00 per room. We look forward to welcoming you in Boutique Hotel ZIES!